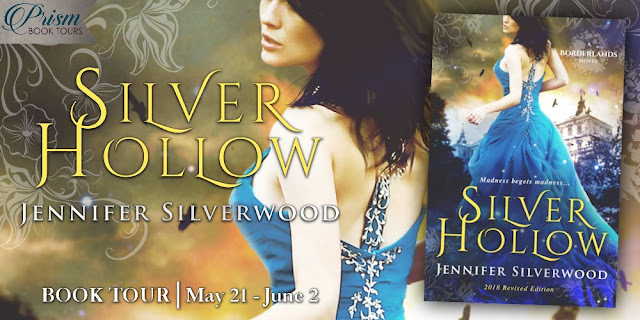 #BookTour #Excerpt & #Giveaway for Silver Hollow by Jennifer Silverwood!! 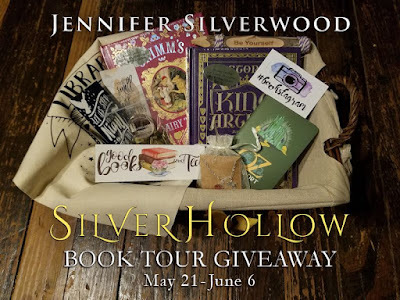 @JennSilverwood @PrismBookTours #Fantasy #Urban #Books #WIN #PRIZEPACK #booklovers | Stacking My Book Shelves! They jumped off the train together, her rescuer pulling her into his side as they hovered in the wind. 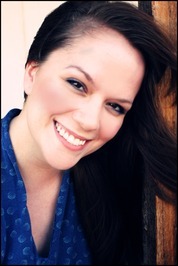 Amie screeched as her body was left behind in sudden freefall. Time slowed as they flew over a sea of green and heather before gravity rushed to catch up. The Brit wrapped his legs around hers, sandwiching her body and taking the brunt of the impact as they rolled down an endless hillside. She wondered briefly if this was the end and wasn’t as upset as she should have been. Twenty-eight years and what did she have to show for her life? But their limbs weren’t dashed against rocks as she half expected. They tumbled to the bottom of the hill and her heart felt as if it beat in her stomach. Besides a few aches and bruises, she was fine. The sky was a soft shade of cerulean and the distant rush of water sang in her ears. The Brit’s chest heaved beneath her and his heart beat in time with hers as they caught their breath. His hands were still tightly pressed to her flesh, as if he was afraid to let go. Heat built beneath her skin as she recovered her wits. She hadn’t been this close to a man before and she didn’t even know her Brit’s name. His strength was obvious behind the layers of clothes and Amie found she didn’t wish to move. “Well,” the Brit began, “that could have been a lot worse.” He released his hold and helped her stand on shaky legs before dusting off the sleeves of his trench coat. Rain began to fall unexpectedly overhead. Amie took him in, from his wet, upright mud-flecked black hair and his amused expression. “Are you crazy?” she snapped, “We almost died!” She hit his chest for emphasis. “Fine way to thank me for saving your life again,” he quipped with no small dose of sarcasm. “What did you expect me to say? Thank you so much for pulling me off that moving train. Now we’re stranded in the middle of God-knows-where. What am I supposed to do without my things? All I have is my…where is my bag?” Amie groaned as she paced a tight circle. Nothing but the hills above and forest behind them. The train continued further along up the hill, growing increasingly smaller and the reality of their situation filled her with wrath. “If you would only stop raving at me a second I could explain,” he spat back. An explosion ripped the words from his mouth and roared in her ears. His arms circled her again as the train burst from the tracks. Fire claimed each car in rapid succession as the train combusted with a fiery bellow and a shower of debris and black smoke rained from the sky. Amie forgot her belongings as she remembered the conductor’s kind face, and wondered who else had been on the train. 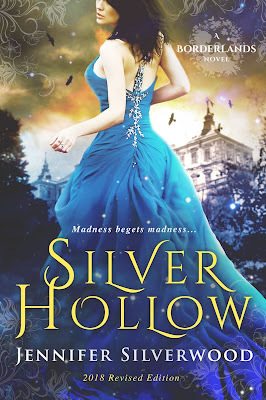 She covered her mouth with her hands, ignoring the constant ringing in her ears. “Right, thank Oberon that’s over and done with,” her companion spoke from behind her. Amie shook her head and managed to tear her attention from the horrific sight above long enough to glare at him. The tall Britt surveyed the scattered debris with something akin to amusement. She felt sick. “Is this funny to you?” She rubbed the scar above her chest to soothe its persistent tingle and blocked his path. “You checked the logs?” Amie snorted with little ladylike grace. “I’ll have you know I’m thorough with my jobs!” he declared, the hint of a smile about his lips. “What do plants even…” He shook his head. “Perhaps you should refrain from speaking nonsense while we’re being hunted. In fact, why don’t you shut up altogether, savvy?” He jerked her on towards the thick wood bordering the hills in a manner that did not invite protest. “Where are we going?” she asked as they passed underneath the outermost edge of the tree line. Her chucks were not built for hiking. Amie ground her teeth and cursed when she tripped on another rock. “Hey, slow down! My legs are like a foot shorter. Are you even listening to me?” With a fierce slap to his wrist, she managed to break free. Only after he turned around with crazy eyes did she regret her rebellion. He stalked forward until her back was pressed against a nearby oak. “Do you have any concept of what being hunted means?” He loomed over her, invading her space and filling her senses with a blend of cinnamon, smoke and singed fabric. “Sure, I’ve been deer hunting plenty of times. East Texans have like three favorite pastimes.” Not that she ever actually shot a deer of course. Guns were James’s area of expertise in their little troupe. Hi Mary, thanks so much for sharing the excerpt and helping me spread the Silver Hollow love!